TORONTO , March 1, 2019 /CNW/ - Anaconda Mining Inc. ("Anaconda" or the "Company") – (ANX.TO) is pleased to provide an update on the exploration and development activities at the Argyle Deposit ("Argyle"), located approximately 4.5 kilometres from the Company's operating Pine Cove Mill and tailings facility at the Point Rousse Project in Newfoundland (See Exhibit A). Since announcing the Argyle Mineral Resource Estimate on January 8, 2018 , Anaconda has completed an internal project evaluation and engineering that has led to development of an optimized pit shell and a cash flow positive mining plan. It has also initiated the permitting process, conducted infill drilling and successfully identified high-grade, wide intersections of mineralization immediately adjacent to the known Mineral Resource. In addition, the Company has discovered another area of very high-grade mineralization associated with visible gold approximately 800 metres from the main Argyle Deposit. Anaconda expects Argyle to contribute to the production profile at Point Rousse in the third quarter 2019 and anticipates expanding the known Mineral Resources in the area. "We are progressing toward production at Argyle and expect the deposit to be incorporated into our mine plans in Q3 of 2019. Preliminary permits have been received and we will finalize mine planning following a resource update in May, which will include the additional drilling completed since the last Mineral Resource Estimate as well as our current infill drilling. As we move Argyle into production this year we will also follow up on the high-grade visible gold encountered in hole AE-18-83 which is one of the best intersections of gold within the Point Rousse Project to date." In addition, to better align the long-term incentive plans of directors, officers, and employees with Anaconda's shareholders, the Company's Board of Directors has approved the adoption of a Share Unit Plan, subject to approval of the shareholders of the Company at the upcoming Annual General and Special Meeting and made certain grants under the Plan as part of year-end performance reviews and director compensation. Please see below for further details. The Company has completed an exploration program consisting of 2,810 metres of diamond drilling in 22 holes approximately 250 metres to 1,250 metres northeast of the Argyle Deposit ("Argyle Exploration Program"). The Argyle Exploration Program targeted an area that exhibited anomalous ground IP and soil geochemical characteristics as well as surface alteration and favourable geology similar to the Argyle Deposit area. Drill hole AE-18-83 intersected two occurrences of visible gold coincident with composited assays of 59.39 grams per tonne ("g/t") gold over 7.0 metres (32.0 to 39.0 metres) including 413.90 g/t over 1 metre and 6.21 g/t gold over 2.0 metres (96.0 to 98.0 metres) (Exhibit A). These intersections are associated with an alteration system similar in character to the Argyle and Stog'er Tight Deposits. The alteration system extends for 250 metres as identified in core by eight drill holes completed during the Argyle Exploration Program; however, Hole AE-18-83 was the only one to return significant mineralization. To better understand the controlling structures associated with the two high-grade gold occurrences, Anaconda is planning a trenching program and further drilling during the spring of 2019. No significant gold mineralization was encountered in the remainder of the alteration system northeast of Argyle. A portion of the anomalies encountered were associated with an iron stone formation as well as a certain stratigraphy that is typically not mineralized. 1.15 g/t gold over 8.0 metres (3.0 to 11.0 metres) in hole AE-18-100. Anaconda is currently drilling additional infill holes on the eastern portion of the Argyle Deposit. These results will be released at a later date. 12.47 g/t gold over 5.0 metres (54.5 – 59.5 metres) in hole AE-17-58. A table of selected intersections from both exploration and infill drilling programs are shown in the table below. The Argyle project was released from environmental assessment in November of 2018. The Company has submitted a Development Plan and is finalizing a Rehabilitation and Closure plan to be submitted to the Ministry of Natural Resources by the end of Q1 2019. Once Anaconda receives approval of the Development, Rehabilitation and Closure plans, it will be ready to begin mine development and site construction, which is expected to be by the summer 2019 with ore production commencing in the third quarter. The Argyle Deposit, located 4.5 kilometres east of the Pine Cove Mill adjacent to existing road networks, is defined over a strike length of 685 metres and to a down-dip depth of 225 metres and is open for expansion in all directions. It currently contains an Indicated Resource of 543,000 tonnes grading 2.19 g/t gold (38,300 ounces) and an Inferred Resource of 517,000 tonnes grading 1.82 g/t (30,300 ounces) as outlined in the table below and is detailed with a 43-101 technical report titled "43-101 Technical Report, Mineral Resource and Mineral Reserve Update Point Rousse Project, Baie Verte, Newfoundland and Labrador, Canada " with an effective date of December 31, 2017 . All samples and the resultant composites referred to in this release were collected using QA/QC protocols including the regular insertion of certified standards and blanks within each sample batch sent for analysis and completion of check assays of select samples. Drill core samples were routinely analyzed for Au at Eastern Analytical Ltd. in Springdale, NL ("Eastern"), using standard fire assay (30g) pre-concentration and Atomic Absorption finish methods. Eastern is a fully accredited firm within the meaning of NI 43-101 for provision of this service. 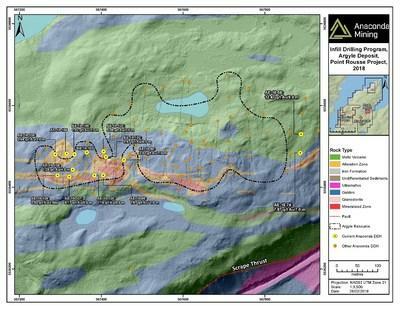 Mineralized intervals referred to in this press release are reported as drill intersections and are apparent widths only. Apparent widths reported in this press release are estimated to be approximately 90-100% of true widths. Diamond drilling at Argyle outlined within this press release, benefited from a JEA grant from the Department of Natural Resources, Government of Newfoundland and Labrador . Anaconda thanks the Government of Newfoundland and Labrador for this assistance. To better align the long-term incentive plans of directors, officers, and employees with Anaconda's shareholders, the Board of Directors has approved the adoption a Share Unit Plan, subject to approval of the shareholders of the Company at the upcoming Annual General and Special Meeting. Share Units granted under the plan represent the right to receive one common share, are settled by way of issuance of common shares from treasury as soon as practicable following the maturity date in accordance with the Share Unit Plan. The Share Unit Plan and the existing Stock Option Plan, together, the Incentive Plans, are each a "rolling evergreen" plan and provide that the number of common shares of the Company available for issuance from treasury under the Incentive Plans, in aggregate, shall not exceed 10% of the issued and outstanding common shares of the Company at the time of grant. As part of the further alignment of Directors and Officers with Anaconda shareholders, half of the compensation of the Board of Directors will now be settled in Share Units, which will retain cash in the Company. Accordingly, 85,500 Share Units were granted to directors of the Company in Q1 2019. In addition, the Company has granted 2,355,000 Share Units as part of its annual performance review and long-term compensation grants, with the grant date set for one clear trading day after the release of this press release, consistent with the Company's governance policies. No Share Units granted under the Share Unit Plan shall be eligible to vest until the Plan has been approved by shareholders of the Company. Further details are available in the Company's updated Annual Information Form filed on SEDAR (www.sedar.com) on February 27, 2019 . This news release contains "forward-looking information" within the meaning of applicable Canadian and United States securities legislation. Generally, forward-looking information can be identified by the use of forward-looking terminology such as "plans", "expects", or "does not expect", "is expected", "budget", "scheduled", "estimates", "forecasts", "intends", "anticipates", or "does not anticipate", or "believes" or variations of such words and phrases or state that certain actions, events or results "may", "could", "would", "might", or "will be taken", "occur", or "be achieved". Forward-looking information is based on the opinions and estimates of management at the date the information is made, and is based on a number of assumptions and is subject to known and unknown risks, uncertainties and other factors that may cause the actual results, level of activity, performance or achievements of Anaconda to be materially different from those expressed or implied by such forward-looking information, including risks associated with the exploration, development and mining such as economic factors as they effect exploration, future commodity prices, changes in foreign exchange and interest rates, actual results of current production, development and exploration activities, government regulation, political or economic developments, environmental risks, permitting timelines, capital expenditures, operating or technical difficulties in connection with development activities, employee relations, the speculative nature of gold exploration and development, including the risks of diminishing quantities of grades of resources, contests over title to properties, and changes in project parameters as plans continue to be refined as well as those risk factors discussed in the annual information form for the fiscal year ended December 31, 2018 , available on www.sedar.com. Although Anaconda has attempted to identify important factors that could cause actual results to differ materially from those contained in forward-looking information, there may be other factors that cause results not to be as anticipated, estimated or intended. There can be no assurance that such information will prove to be accurate, as actual results and future events could differ materially from those anticipated in such information. Accordingly, readers should not place undue reliance on forward-looking information. Anaconda does not undertake to update any forward-looking information, except in accordance with applicable securities laws.